The critical point in fetuses diagnosed with CDH is not the defect in their diaphragm, but the lung volume available at birth. Indeed, when inside the womb, the baby gets its oxygen from the mother through the placenta. At birth however, a baby needs his/her own lungs to breathe and to provide sufficient oxygen to the other organs. Although the human lung can still grow a lot after birth, its size might not be enough to provide sufficient oxygen uptake in the first few days of life. Therefore, intensive neonatal care might for some babies not be enough to help them survive. As a consequence, if one would like to improve the prognosis for these very severe cases of CDH, one would need to do something before birth to improve lung growth and to provide these babies with a better start. For more than 25 years researchers have been exploring this path. Initially they tried to provide space for the developing lung in the way it is done after birth: surgeons aimed to repair the diaphragmatic defect already during pregnancy. This required opening of the mother’s abdomen and womb to perform a complex operation on the fetus (called “open fetal surgery”). This procedure was technically possible and worked to a certain extent, i.e. that it indeed created space for the lungs to grow. However, babies with liver herniation (and hence often very small lungs), which would benefit most of these interventions, could not be helped this way, simply because the liver could not be brought back below the diaphragm without kinking and obstructing the blood vessels returning from the umbilical cord. Therefore, repairing the defect prior to birth was abandoned. 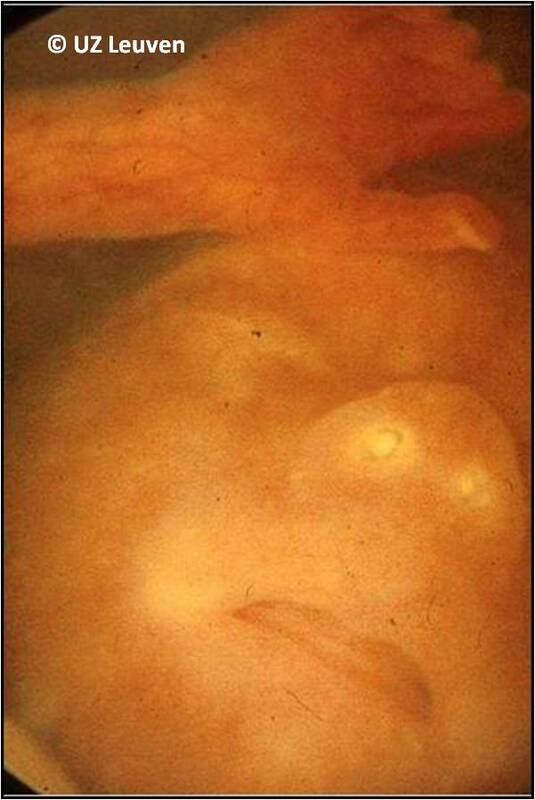 Today the focus of prenatal therapy for CDH has shifted to techniques that stimulate lung growth by obstructing the baby’s windpipe before birth. This causes entrapment of the fluid that is produced by the lungs, leading to an increased pressure within the lung. This increase in pressure as a result acts as a signal for the lung to grow►. The details of this operation are explained further down the page, but basically, the operation can technically be performed in pregnancy without putting the fetus at an increased risk of intrauterine demise such as with open fetal surgery. What makes a lung grow before birth? To understand the current alternative to open fetal surgery, one needs to know how the lung grows before birth. Lung growth is a very complex process that is driven by natural pressure changes within the airways. During pregnancy the baby does not use its lung to breathe as it gets oxygen from the mother. As long as the baby is in the womb, the lungs contain a waterish fluid that is continuously produced by the lung itself. The fluid accumulates in the airways, because the vocal cords at the top of the windpipe prevent it from flowing out. This fluid accumulation increases the pressure inside the lungs and stretches the airways. Additionally and also essential for lung development the fetus makes a kind of breathing movements prior to birth (without air being involved). When the fetus “breathes”, the vocal cords will open. At that moment, fluid escapes from the lungs towards the amniotic cavity, because of the higher pressure within the lungs. This whole cycle of fluid accumulation – pressure increase – breathing – fluid release creates cyclical pressure changes in the airways. These pressure changes, and mainly the episodes of increased pressure and tissue stretch, are the signal for the lungs to grow and prepare for birth. The concept of TO, was first tested and confirmed in laboratory experiments. Lungs do grow following TO provided that the occlusion of the windpipe is water tight and that all fluid stays in the lungs. However things are never that simple as they appear at first glance. The gestational age at which the occlusion is performed and also the duration of the occlusion plays a role in the ultimate quality of the lung. Animal experiments showed that TO can make lungs grow if it is done early enough. However it is not only the lung size that matters, but also how well it does its job of gas exchange after birth. Normal functioning of the lung largely depends on the presence of different cell types in that part of the lung used for exchange of gas. Again experiments indicated that it is better to release the tracheal occlusion at a given time to decompress the lung. Indeed, release of TO is an important signal for the development of a specialized cell type in the lung (so-called alveolar cell type 2), that produces “surfactant”, which is essential for lung function after birth. This sequence of tracheal occlusion and subsequent release is referred to as temporary TO. Summarizing all the above mentioned information, temporary TO before birth can at least partially reverse, the inadequate development of the lung (pulmonary hypoplasia) in CDH babies. Temporary TO also improves blood vessel quality and changes vessel elasticity. Research is still ongoing to improve prenatal lung growth. This can for instance be done, by using medications in combination with TO. Scientists are also looking at other ways to make a lung grow and ultimately try to find a way to avoid a prenatal operation. Obviously closing the fetal windpipe is something one can do in an experimental setting, for instance, simply by tying it off. However for the human fetus this is less than ideal. Therefore, many researchers over the world worked hard to find an acceptable method to perform temporary TO during pregnancy in a minimally invasive way. 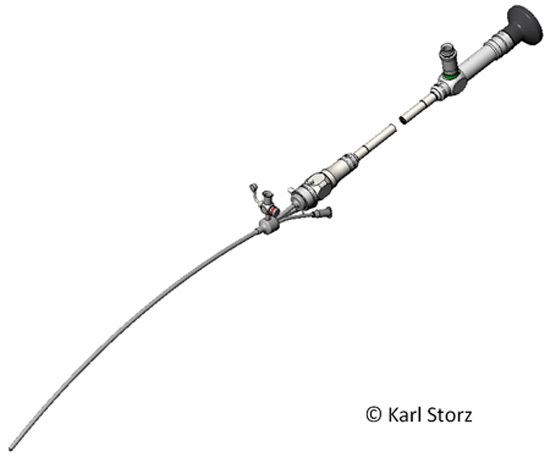 (1) We suggested the use of a small balloon device, inserted into the trachea, to occlude it. This occlusion goes via the “natural” entry to the windpipe, being the mouth and throat of the fetus. This way, an incision of the neck and the risk of damaging structures during the procedure are avoided. Another advantage of using a balloon is that its size can be chosen according to the dimensions of the windpipe. Moreover, a flexible balloon can adapt to changes in the size of the windpipe as it grows during pregnancy. Finally, a balloon occlusion is easier to reverse than a completely tied off windpipe, even during pregnancy. (2) We suggest occluding the fetal trachea using ‘minimally invasive surgery’. As the whole procedure is also done via the natural opening of the windpipe (being the mouth and throat) and the balloon is positioned at inside the windpipe or ‘lumen’, it is called an “endoluminal” procedure. All this explains the name of the final intervention: Fetoscopic Endoluminal Tracheal Occlusion (FETO). The technique was practiced for years in fetal lambs, not only to study its effects on the lungs and the windpipe, but also to develop specially designed instruments and to make the operative team very familiar with the technique. Fetoscopic Endoluminal Tracheal Occlusion is usually referred to by its acronym FETO. Again it takes profit of a minimal maternal skin incision and an even smaller uterine incision to approach the windpipe via the natural orifice. It uses of a small balloon to allow intra-uterine reversal of the procedure and to adapt to tracheal growth. Treating CDH fetuses surgically is not a single operation, but a stepwise process. Its starts with referral of a patient to one of the FETO centers, careful counseling and consideration, performing the occlusion, follow up of the lung response, removal of the occlusion, birth in optimal circumstances and optimal postnatal care, as displayed in the flowchart (Figure 2). Each of these steps is discussed in detail below. Patients considering prenatal therapy are first evaluated again at one of the FETO treatment centers to confirm the diagnosis and to assess whether the individual baby would really benefit from a prenatal operation. Ultrasound and Magnetic Resonance Imaging (MRI) may be used to measure the lung size (link), to determine position of the liver and to rule out as much as possible major associated problems. Further points of interest at ultrasound are the placental localization, the position of the fetus and mainly whether the fetal mouth is surgically accessible. Again a so-called multidisciplinary consultation takes place with one or more specialists and/or a social worker, all of this to ensure that optimal information has been given to the expecting parents. When eligible for the operation the whole procedure (see below) will be explained in detail, with special attention to the time period the balloon is in place as well as the potential complications of both the prenatal intervention as postnatal care. The time point in pregnancy at which the operation and reversal of the occlusion are planned depends on the lung size. Patients are admitted shortly before the operation and their stay in the hospital depends a little on the outcome of the surgery, but typically last about 1 to 2 days. There may be some preoperative evaluations, and the parents can speak again with doctors or counselors. It is a legal requirement that patients give written consent, as for any operation. An ultrasound examination will be done again to check fetal position. For patients travelling from far away, step 1 and this step may be combined. For the FETO operation general anesthesia is only very exceptionally required. The surgeon will most often choose to use either epidural anesthesia (injection into the “back” of the mother, as for a delivery or for most caesarean sections) or local anesthesia. The fetus also gets medication, so that it does not feel discomfort during the procedure and that it remains inactive during the operation. Occasionally the fetus may need to be turned into a better position by external manipulation. The fetal medicine specialist will then make a 5 mm incision in the maternal skin and introduce an even smaller sheath (3.3mm in with) into the uterus under ultrasound guidance. Through this sheath a small camera (the fetoscope) is inserted in the uterus (Figure 3). The surgeon can then see what happens inside the uterus on a video screen. He looks for the fetal mouth and then moves further towards the windpipe. Just above the bifurcation of the windpipe into two branches for the two lungs, he inserts a small balloon. After inflation of the balloon it is detached. The instruments are withdrawn and a single stitch is left on the skin. The mother may get antibiotics and medication to keep the uterus from contracting. After a short hospital stay of 1 or 2 days, the mother is allowed to leave the hospital. 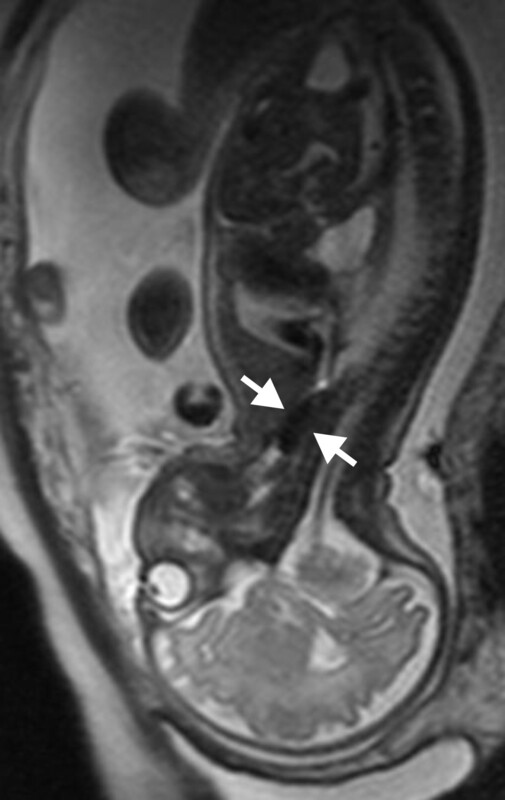 The day after the procedure and on a regular basis thereafter, the position of the balloon as well as the increase in lung size is measured, using ultrasound (Figure 4) or fetal MRI (Figure 5) if appropriate. The mother will be recommended not to do heavy efforts. The number and timing of visits will be organized according to the case presentation, as well as to more practical and social aspects. However, there is now one important thing to keep in mind as long as the balloon is in place. Until the removal of the balloon, the baby has obstructed airways. If for whatever reason the baby is born, the balloon must be removed to allow the baby to breathe. Removal should thus be performed at the latest at the time of birth, but ideally this is done before. Although an unplanned situation is unlikely, the baby may come earlier than planned. At that time the patient must be able to travel to the FETO center, where a team that is equipped and used to remove the balloon in case of an emergency is available 24/7. The FETO centers therefore assist their patients with accommodation close by. Patients not willing to stay near the FETO center must bear in mind that an early delivery can create an emergency situation, which might not be handled adequately by the local caregivers, as they are not familiar with the procedure. In such an emergency situation, the occlusion can be reversed either by puncture of the balloon under ultrasound guidance, or during a modified caesarean section, which allows the baby to profit from placental support while the balloon is removed via the throat. Postnatal retrieval by puncture or via the throat is another (non preferred) option. Prenatal or perinatal balloon removal requires special instruments and a drilled and experienced team. The FETO centers cannot guarantee this outside of their own institutions. As emergency situations cannot be left to hazards, they will be discussed extensively and clarified ahead of time. If the mother experiences fluid leakage, she most likely has ruptured membranes. She needs to be examined and if it is confirmed, the mother will be admitted and managed accordingly. In the majority of cases, this does not lead immediately to contractions, but the risk for it is increased. If that happens, and labor cannot be arrested everything will be prepared for balloon removal via the most appropriate method. For balloon removal, the mother will be re-admitted at the FETO center, in most cases around 34 weeks of pregnancy. Medication may be given to let the lungs mature, as well as eventual antibiotics to prevent infections and drugs to avoid uterine contractions. Prenatal balloon removal can be achieved by different techniques, its choice being dependent largely on the case presentation. The balloon can be removed in exactly the same way as it was inserted, i.e. by fetoscopy which is virtually no different from the first procedure. Under direct vision through the camera, the tail of the balloon is grasped, punctured and extracted. Alternatively, puncture can be done under ultrasound guidance. After removal of the balloon, the mother is also hospitalized for a short period (1-2 days) just as after the first procedure. If the postoperative course is uneventful, the mother is discharged and referred back to her local tertiary care center. The pregnancy is continued and delivery is normally planned after 38 weeks. Very rarely it is necessary to remove the balloon via a modified caesarean section, during which the baby is delivered partially, so that it still receives oxygen trough the placenta, while the balloon is being removed. If such a procedure needs to be performed, the baby will be born at the time of balloon removal and therefore it may be planned later in pregnancy. Again, babies with CDH must be born in optimal conditions. Whenever possible, the moment of birth will be planned ahead of time, in order to have all required people available. If there are no concurrent problems the baby will typically be delivered around 38 weeks. The immediate postnatal care of such babies consists of resuscitation and stabilization, respiratory support through adapted ventilation, the use of medication to assist lung function and blood circulation or other additional techniques. Surgery is offered once the baby is stable from a respiratory point of view. This is typically within the first 10 days of life. The managing neonatologists can always contact with the FETO centers for eventual advice, as these centers are more familiar with the management of a baby after balloon treatment. At this moment (2011), the FETO centers have much experience with keyhole surgery in pregnancy (over 300 procedures per center). Their cumulative experience with the FETO procedure itself is over 200 procedures. Therefore reasonable statistics can be given about this operation, i.e. its effects and potential complications. At this time the only available results are regarding FETO procedures in cases where there is severe lung hypoplasia, with the prediction of a very poor outcome. Experience in other cases is limited or absent. In these series the insertion of the balloon was done between 26 and 28 completed weeks of gestation, whenever it is possible to have the patient at the FETO center. Ideally the balloon was removed at 34 weeks of gestation, thereafter patients were referred back to their local tertiary care center. The average operation time was around 10-15 min. 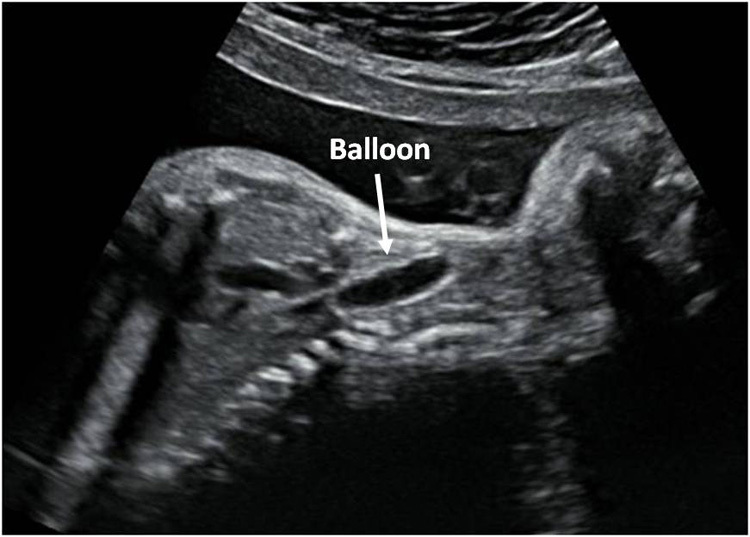 In about 3% of cases it may not be possible to place the balloon in the correct position at the first attempt, mainly due to a difficult position of the baby. It can also rarely happen that the balloon deflates, mandating a second FETO. Overall there seems to be a 30-35% increase in survival compared to what can be expected with postnatal management. The lung response seems to be proportional to the size of the lung prior to the procedure. In other words fetuses with somewhat larger lungs within the group of those with small lungs to start off with, respond better than those with extremely small lungs. Also, the effect is more pronounced when the balloon is inserted prior to 30 weeks of gestation than thereafter. FETO is a minimally invasive operation (also known as keyhole surgery). There is extensive experience with keyhole surgery in fetal medicine and there are no known serious complications for the mother. The most common and important complication of FETO is early rupture of the membranes with vaginal leakage of amniotic fluid. This problem occurs within one week from FETO in about 5% of cases, and within six weeks in 20% of cases. The leakage of amniotic fluid may continue for several weeks until delivery. In some cases the leakage may stop and the pregnancy continues normally, unfortunately in other cases this rupture of membranes leads to preterm labor and delivery. The consequences of preterm birth depend on the gestation at which this occurs. Normal babies born after 32 weeks usually survive without any long-term problems, but may require neonatal intensive care. However, prematurity together with congenital diaphragmatic hernia may increase the risks of death or long-term breathing and feeding problems. Earlier animal experiments showed that the balloon does not cause any serious damage to the trachea. This has also been our experience with the majority of babies born after FETO. However, in a few babies there was local widening of the trachea. It is uncertain whether this widening was due to the balloon, the ventilation tube introduced into the trachea after birth (which also has a balloon), or due to other complications arising from the diaphragmatic hernia itself. However we have to assume that this may be caused by the balloon. This widening in itself has resulted in mild breathing problems in a few cases (mainly barking cough), but these were usually temporary. Minor other complications that could occur in more than 1% of cases include localized bleeding or wound infection at the entry site of the instruments.